Just steps to your private beach. Rare opportunity to be just seconds to the beach... East of A1A bordering prestigious Gulfstream in the laid back Palm Beach 'county pocket' just minutes from Delray Beach. You can hear the ocean from your bed!! This is a real beach house with yard, private parking and private beach access to one of the least-visited beaches in South Florida. 1 bedroom / 1 bath cottage with approx. 700 square feet with private covered patio. Fenced back yard with private off-street parking for 2 cars. Freshly remodeled with central AC, full kitchen with all appliances (including dishwasher) and washer and dryer. Ceiling fans in all rooms. Floors are saltillo tile and the bathroom has a large, tiled walk-in shower. Fully furnished living room (with sleeper futon), dining area, bedroom with new king-sized bed and patio furniture, BBQ and beach chairs. 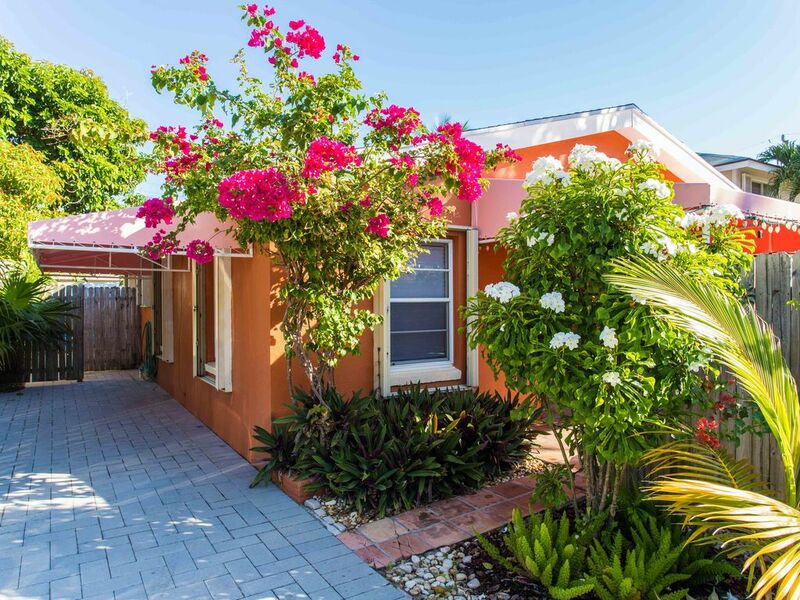 The cottage is nestled between Ocean Ridge and Gulfstream in a very unique and quiet unincorporated beachfront location. If you want a quite/private beach while you relax this is the place. For nightlife and shopping Delray’s Atlantic Ave. is just 5 minutes away. For commuting I-95 at Woolbright can be accessed in 5 minutes. The cottage has high speed wifi and AT+Ts Uverse cable with hundreds of channels. There are flat screen TVs in the bedroom and living room. For diving and snorkeling, there are several reefs just off shore so you can have your own diving holiday every weekend. The cottage was adorable, clean, comfortable and homey. We liked that it contained everything you would need for the beach, patio and grill. We had a fabulous time and look forward to next year. The house is in a quiet neighborhood a few minute walk to the beach. It was well stocked with the household supplies we needed for the week. There are a number of excellent restaurants close by. It was a convenient drive to the Washington Nationals spring training facility a little to the north which was the main reason for our trip. We highly recommend it for a one couple beach getaway. Great beach vacation! The owners are wonderful and the house had everything we needed and then some! Stayed the month of January. The property was exactly as advertised. Clean, comfortable and well equipped. Location was great. Steps to the beach and around the corner from Old Beach Blvd—perfect for running, walking and biking. Ownership was great. We really enjoyed our stay. Prepare to be wow'd! If there is a VRBO all star list, this needs to be on it. The house was very well maintained and just the right size for two of us but adaptable to accommodate more. You won't realize how close you are to the beach until you arrive. You will quickly become part of their little community, either acting like you have always been there or that you are never going to leave. You won't want to. A seaside market, a surf shop, and the beach are all with in a very short walk and is all you need because the house has everything else. The neighbors were inviting and friendly. The area is quiet and comfortable. If you want to venture further there are many restaurants and areas to explore, including some very impressive estates that line A1A. If you want to experience the charm of Old Florida, this is your place. I guarantee you'll be booking your return before your trip is even over! Great restaurants, shopping, and outdoor activities are just minutes away.